Product page at manufacturer website and at official store at Aliexpress. 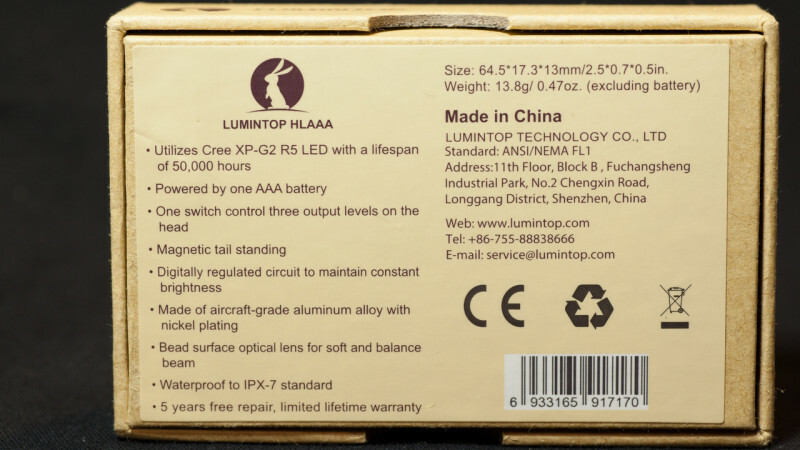 I consider Lumintop to be a company who is a way better in micro rather than in macro. 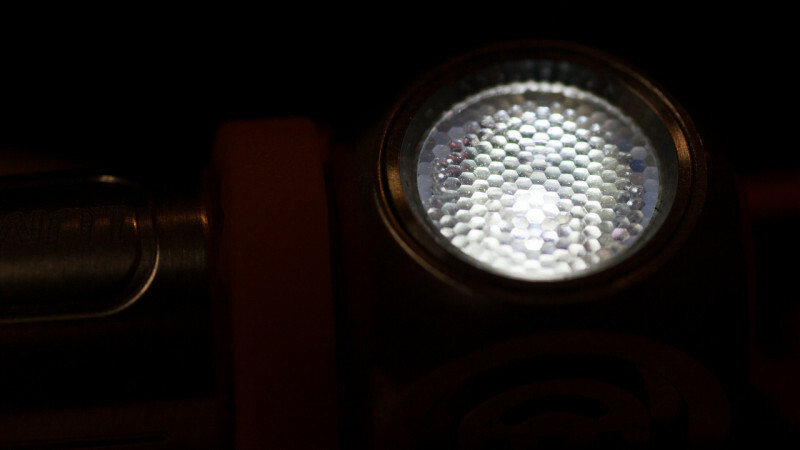 Their small lights are reliable and popular – tool and worm are best examples. 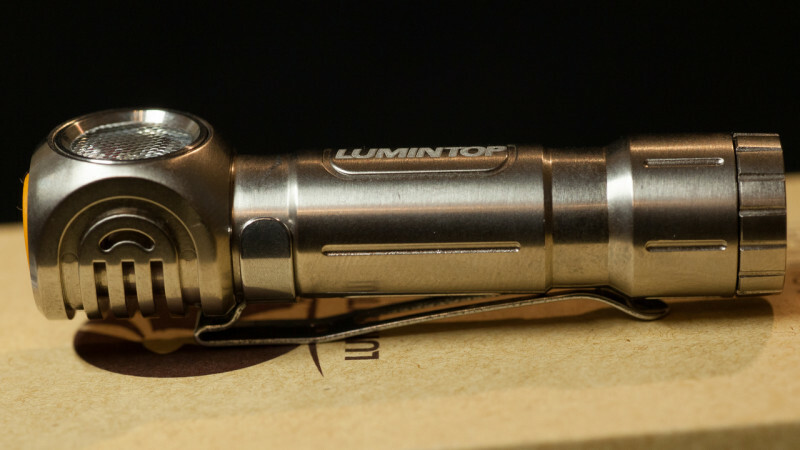 Lumintop Ant for me is 100% ideal of keylight desing, that is what I love in small flashlights in each detail. 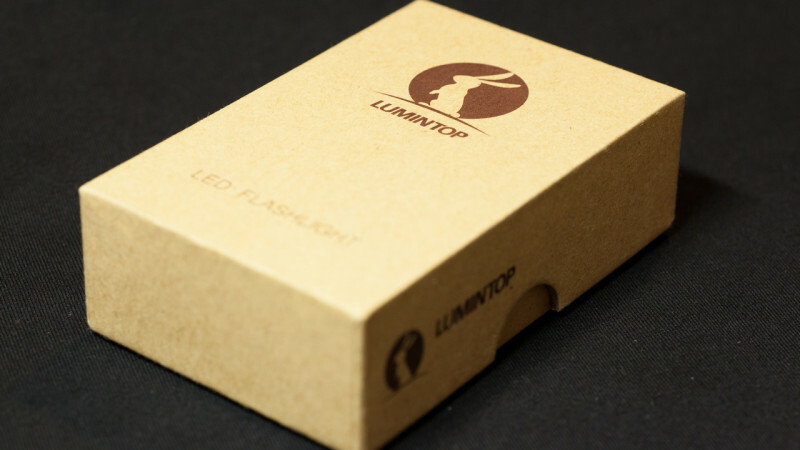 Flashlight`s package is well-known brown thick cardboard box that we`ve seen in at least 5 last Lumintop models. Yes, that adds a lot to survival skills (none of these boxes were crashed during postal travel from China to Russia), but once I liked new package of Tool AA\AAA I`d prefer last one, if I want to order HL AAA for a gift. Nevertheless, package is modest in design, but definitely ok. There are a sticker with specs on rear side of box. 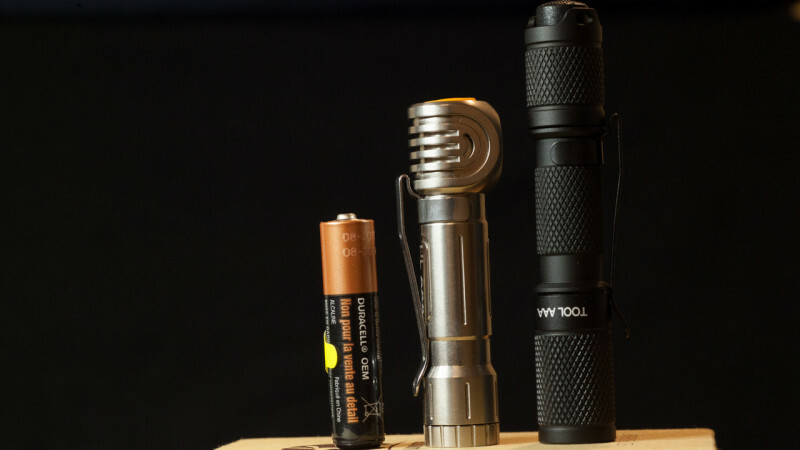 There are just few things that come along with this light: HL AAA itself, AAA Duracell battery, manual and o-ring. Well, few, but enough. I also got decent head strap for review, found no info where to buy it, wait a reply from manufacturer. And here comes our hero. 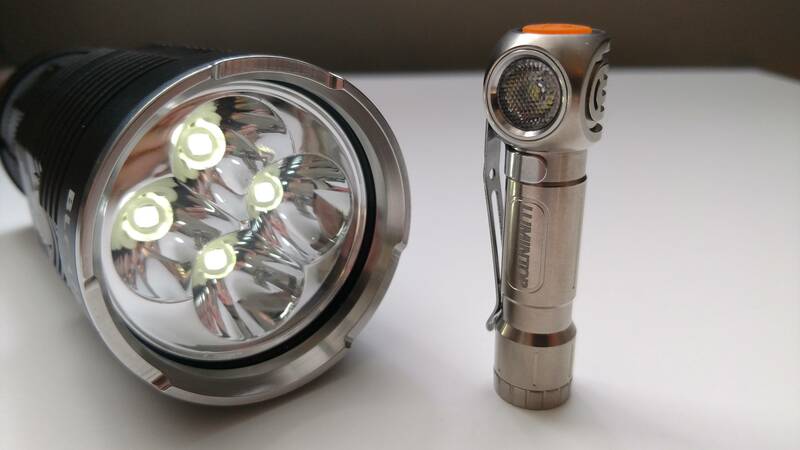 Size, comparing to other AAA powered lights, is shorter, just 65mm. 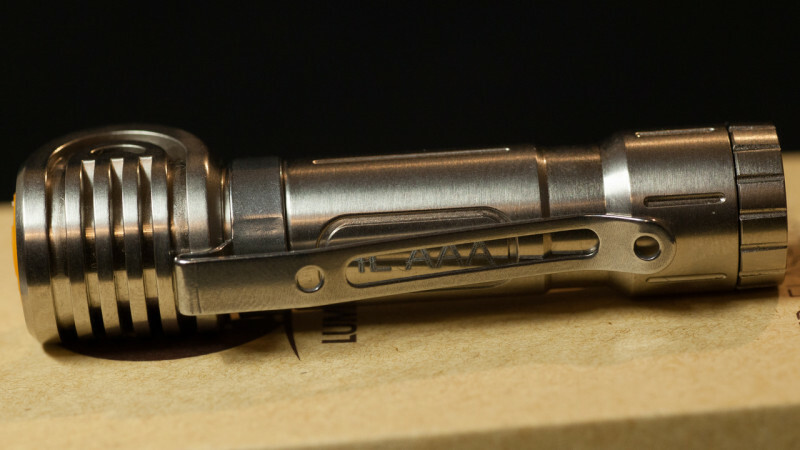 But in these 65mm you`ll get feeling of full-scale 18650 powered headlamp in each detail. mi-mi-mi =^.^= this little stuff is sooo nice. I was surprised to see springs from both sides. I recommend NOT to take clip off as it is too tights and putting it back will result in having flashlight body scratched. Please consider that this is a macro photo and in reality, they are tiny-tiny. But they are visible anyway. 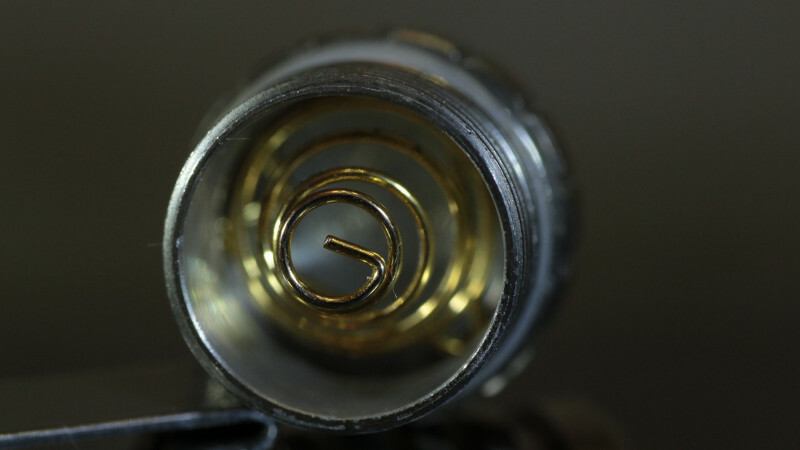 I also asked manufacturer if there will be NW\Nichia version, which, I bet, will find it`s users. Cooling ribs are quite big, comparing to size of head. Semi-transparent button covers all the upper part of head. Click is significant, you can easily find button with finger. I`ve mentioned head strap. This one is good, old-school 0-shaped ,with gel straps insides, for better hold on head. 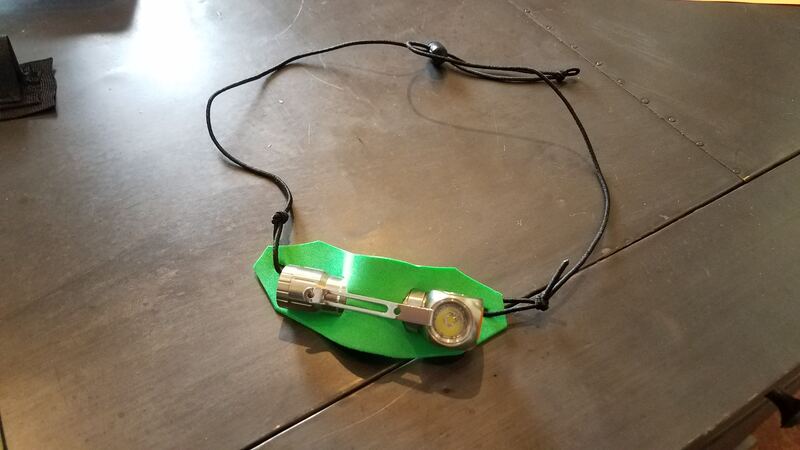 You have to take into account that without this strap, it will be almost impossible to attach HL AAA to baseball cap like regular headlamp, which you can easily do with Tool AA\AAA. Normally you supposed to use it like this. So, what `bout appearance – I totally liked it. 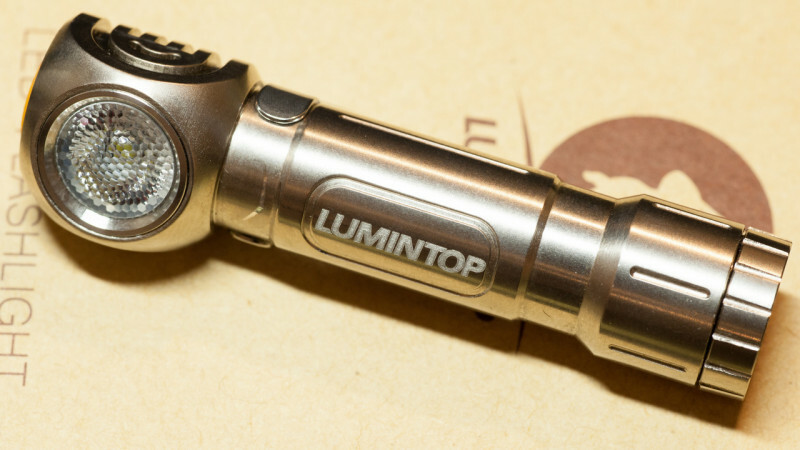 Lumintop did a great desing job here. Also, I haven’t noticed any visible bugs in build quality. And here is a significantly uncool part…As you can see – there are no lockout mode. 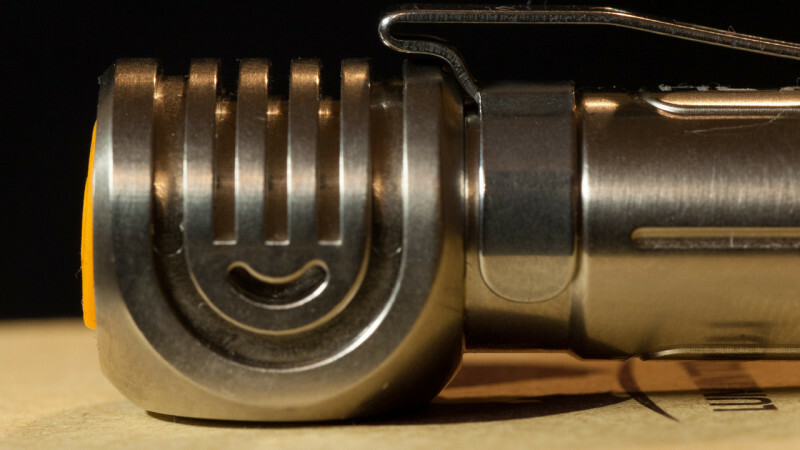 Also you cannot simple unscrew tail part as you do in most of keylights – spring is too long. 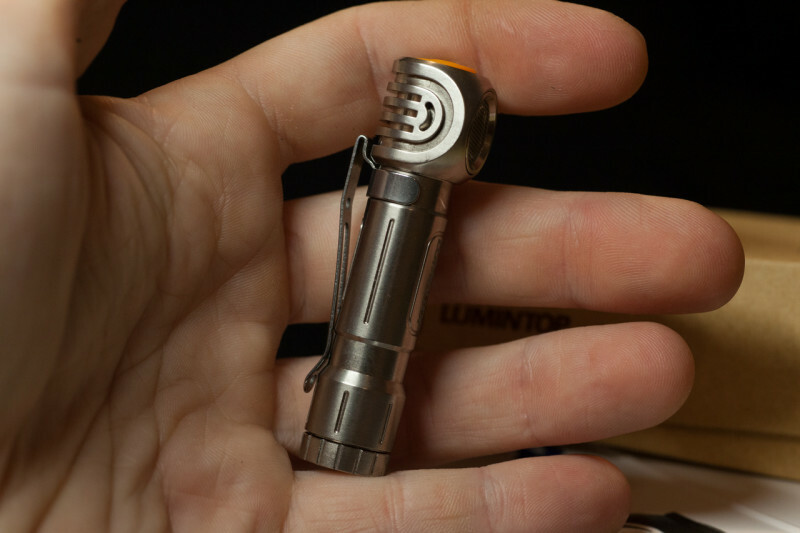 So if you carry HL AAA along with you in tight pocket – chances to get it turned ON are big. That is not cool. For example, 5 sec press to activate lockout mode will be really good addition and (I believe) will not be a challenge to engineers. CW light. Each of you, I bet, own at least one light with XP-G R5 , so you understand what it is. There is no visible PWM-shimmering in any mode. Light is, no surpise, extremely diffused. 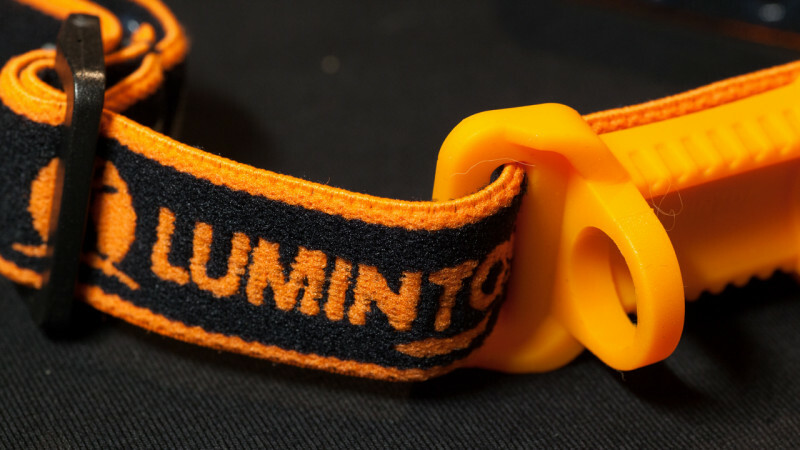 And though it is not that big in lumens number, it is still useful, please take a look. MID is ok for camping tent, shelf searches, car repair, even to illuminate path in 3- meters away from you. I must add that, HL AAA will perform good in darkness, in evening light low-mid will be too dim to struggle with parasitic light. The same door, 9 meters. As you can see, light is quite bright and enough for lots of needs. Here is the time to take a look at charts, which is surprisingly relevant to specs. Good runtime and stabilization. 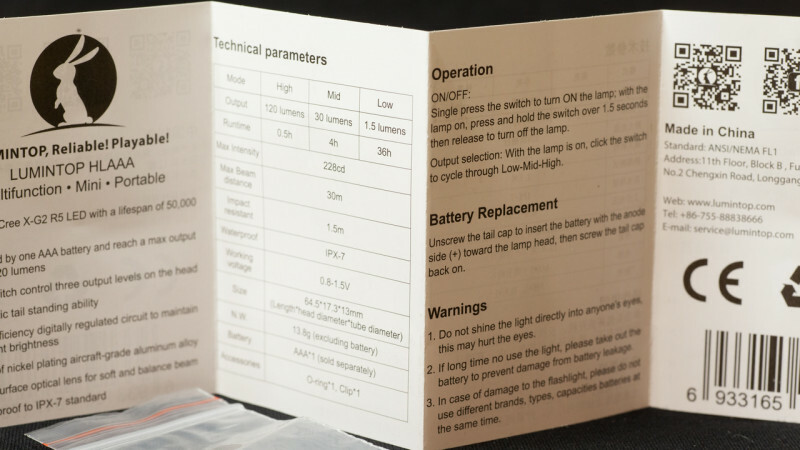 I Like this light and would rate it excellent in design, good in performance and functionality and disputable in UI usefulness (absolutely due to potential problems with occasional turning on). 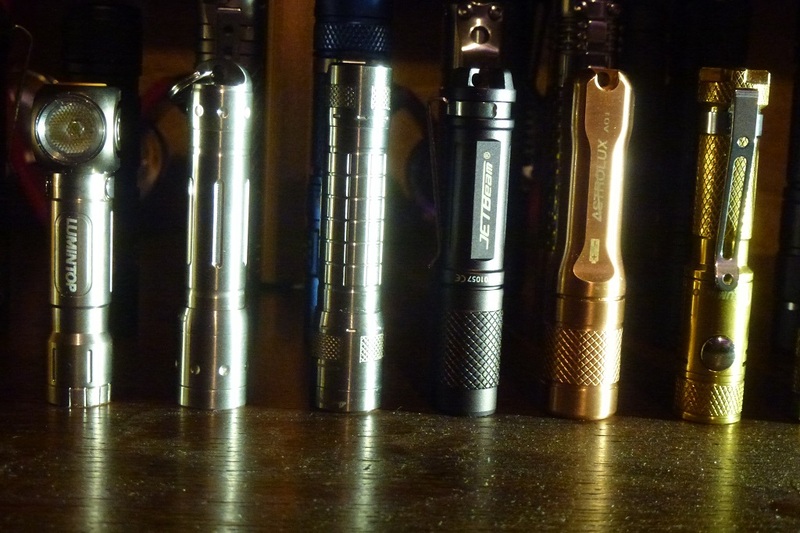 If you like flashlight (well, once you`re here, I think you do), especially small ones, HL AAA will be a good gift for yourself on forthcoming X-mas\New Year. 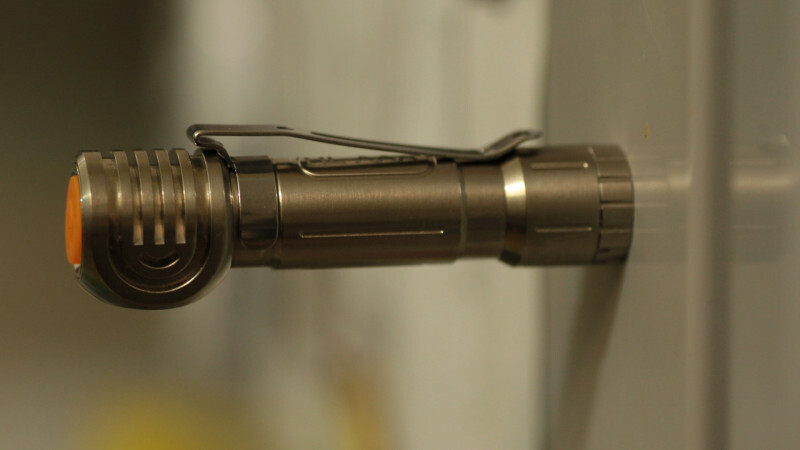 That is a pretty nice light, no idea it was that much smaller than a tool. Thanks for the comparison and review. Run time seems on Par with the other AAA offerings. Cute little one, light too. 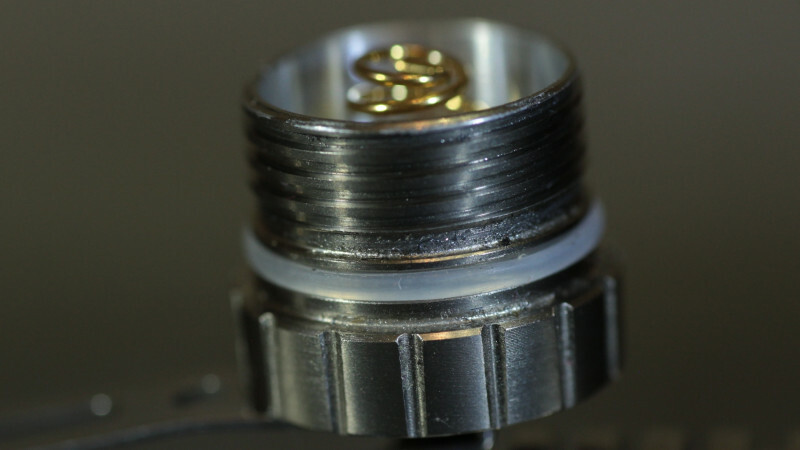 A way to clip a L-shaped light on a base cap (without a headband) is to clip it on the width regulation on the backside the cap. Excellent review!!. I enjoyed reading it. I had no idea this was so tiny. I like it, will pick one up when it is a few bucks cheaper. 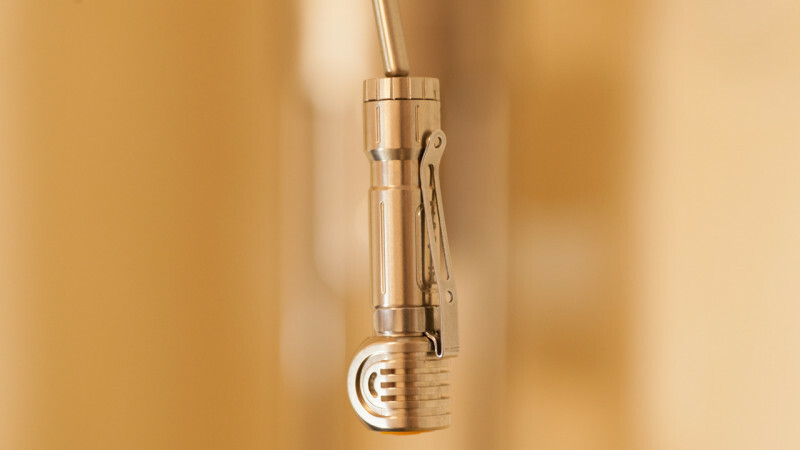 If you wear the bill left, width regulation right and you turn the clip on the lamp sideways and you clip it an the width regulation. You should be able to rotate the lamp up and down a bit. I mean a few bucks cheaper than that too. 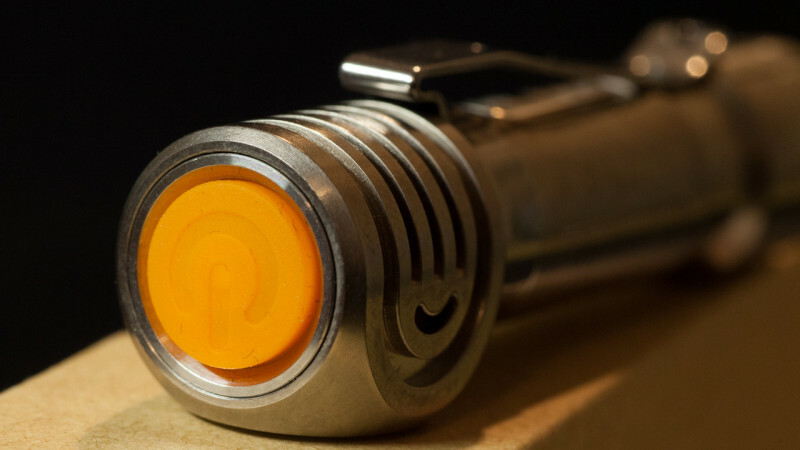 Then you’ll get to see if there are any kinks that need to be worked out of this flashlight as well. I got one delivered this week. 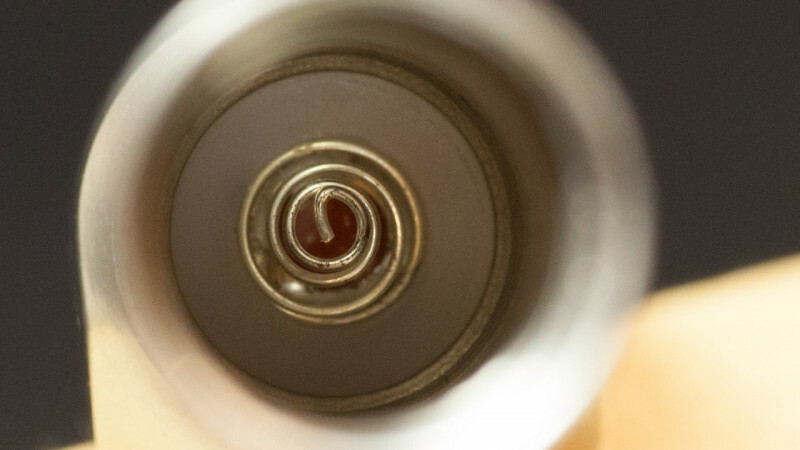 Wanted to swap emitter… but I can’t get the Bezel unscrewed. Anyone have success let me know. I have tried heat and several attempts over a couple days. But I am thinking it is press fit, I hope I am wrong. 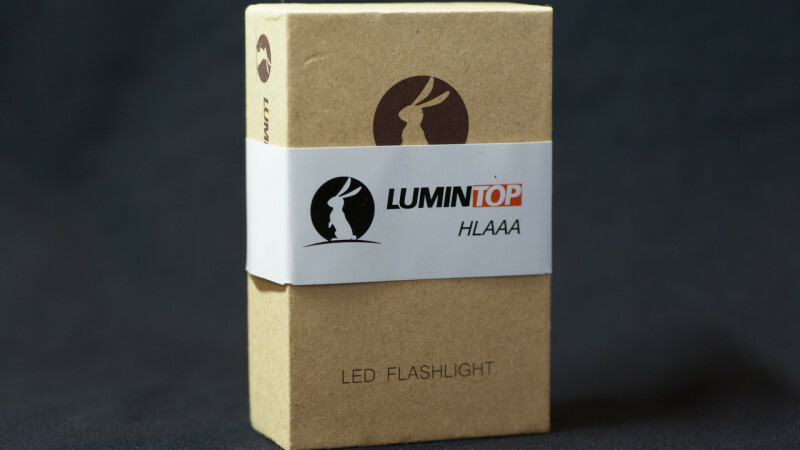 In lumintop fashion it may work but not advertised or advised to do so. If I could get mine apart I would try for ya. Hate to blow up something I can’t fix. 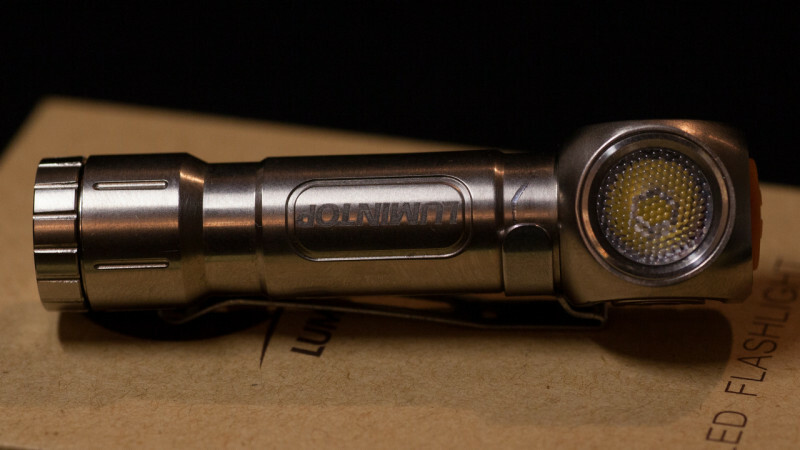 I’ve been looking for a decent AAA light for a while, and I’m happy that I gave this one a try – good build quality, pleasant beam, decent pocket clip and sensible brightness levels. 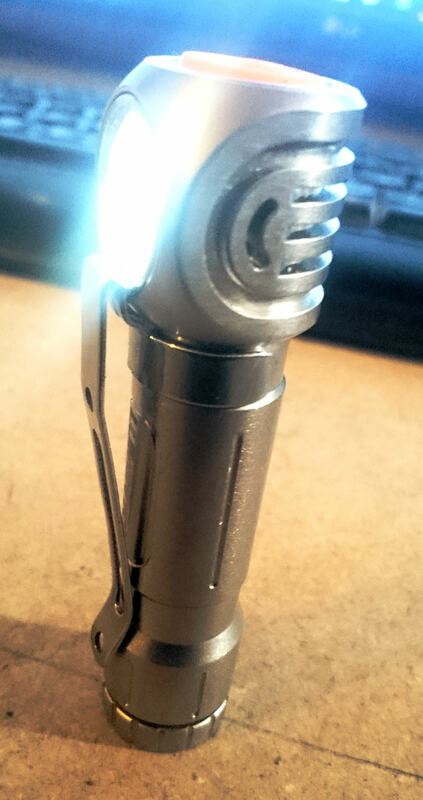 Never been a fan of pocket clips and usually find them annoying, but with an L-shaped light it finally all makes sense! I got mine a few days ago. the one thing i like about the pocket clip is it can spin all the way around so the clip is in the front like FlyingL shows in his picture. 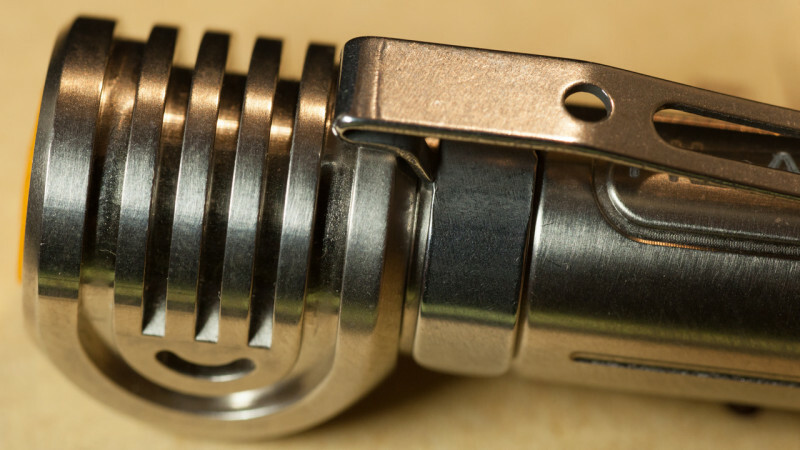 With the clip in that direction you can clip it into a pocket vs being clipped on the outside of the pocket. The diffused light tint is cool white but maybe less blue then my worm…whatever the difference it is easier on the eyes. I would prefer a firefly mode for low and a little more lumins for the medium but that’s just me. 1. 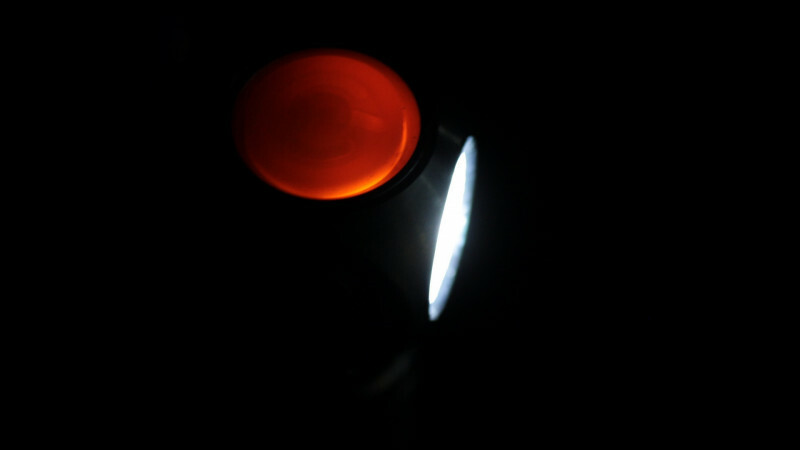 I wouldn’t mind the hold to turn off if they made it so the light would turn off itself while I’m holding it (similar to a fenix hl10). Right now, I have to guess if I’ve held it down long enough before letting go. Makes it so the 1.5second turn off time (which is kind of long itself) stretches to 2+ seconds, or I risk not getting it right and it switching to a higher beam. 2. Adding a tail lockout. 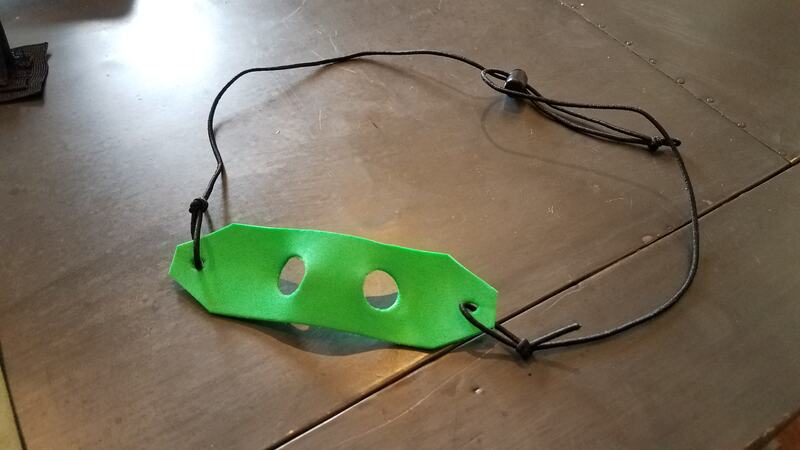 Anyway, as for headbands…they do now make a version that includes a headband for a few bucks more. 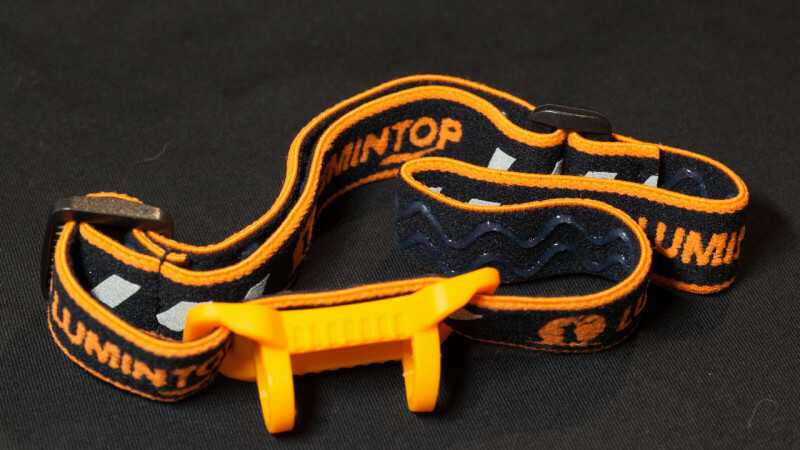 Though…there are several options for a much lighter headband. 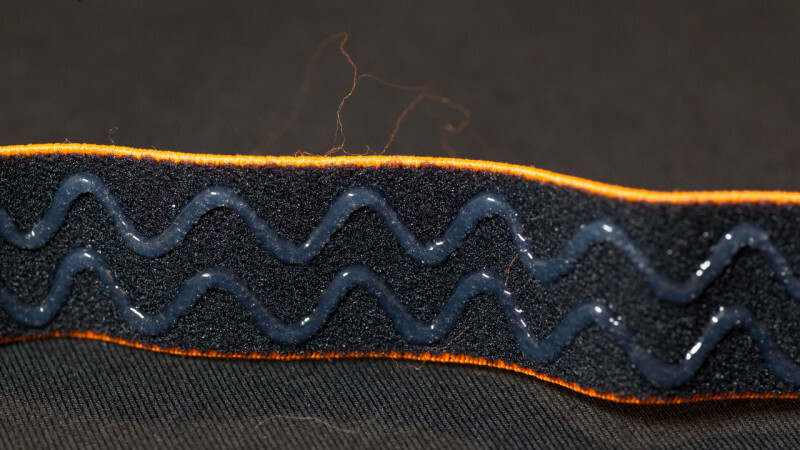 Or…I didn’t make this one, but a bit of thin shockcord, micro cordlock and a small piece of foam sheet makes a great headband for .075oz (2.35g). 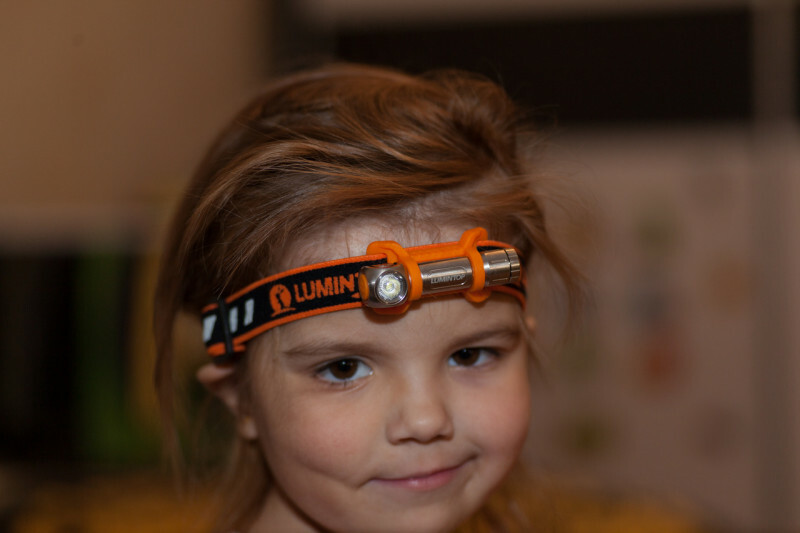 It works because the lumintop hlaaa is so light itself…it won’t feel like you have anything on your head. 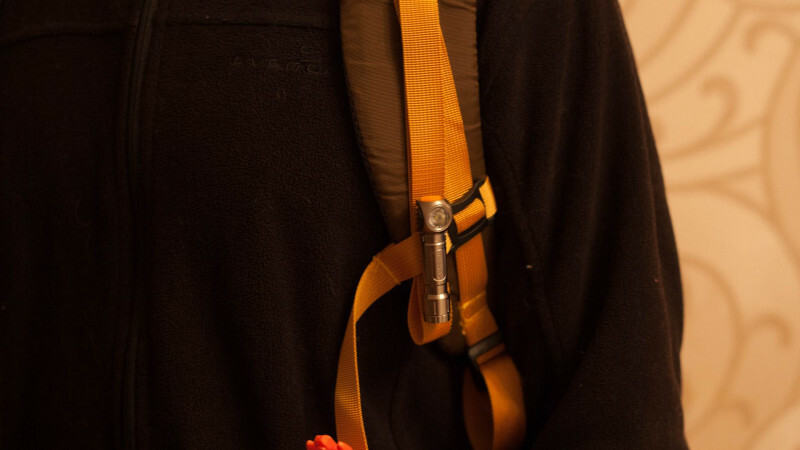 Not a tail lockout, and not very neat (ad hoc experimenting), but it works and prevents accidental pocket turn ons. It's just a washer shaped a bit to fit around the button and to flush with the head edges. Don't ask about the paint. 8) On the next one I know what to do to make it look neater. Welcome to the forum gogdog! Great 1st post! 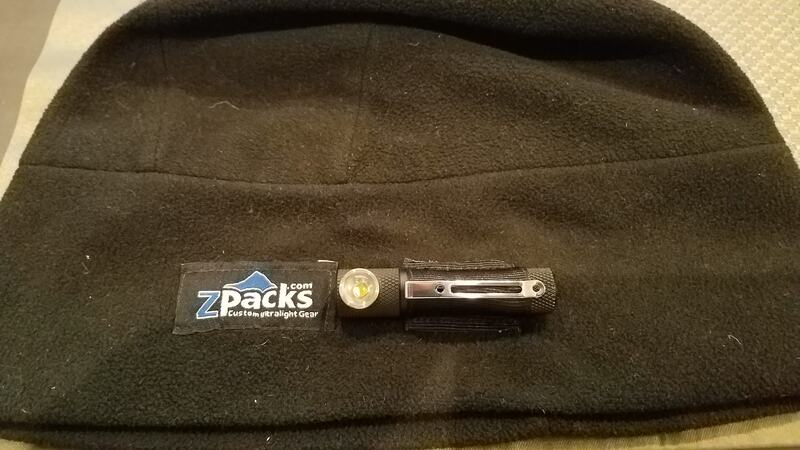 I would like to learn to sew, I have so many clothes I would make a custom flashlight pocket for, similar as you did with the beanie. Also an interesting looking head light in your beanie, what is that one? I received one last week and although i haven’t really used it, i like it a lot. One notable thing you did not mention is it’s tiny size. 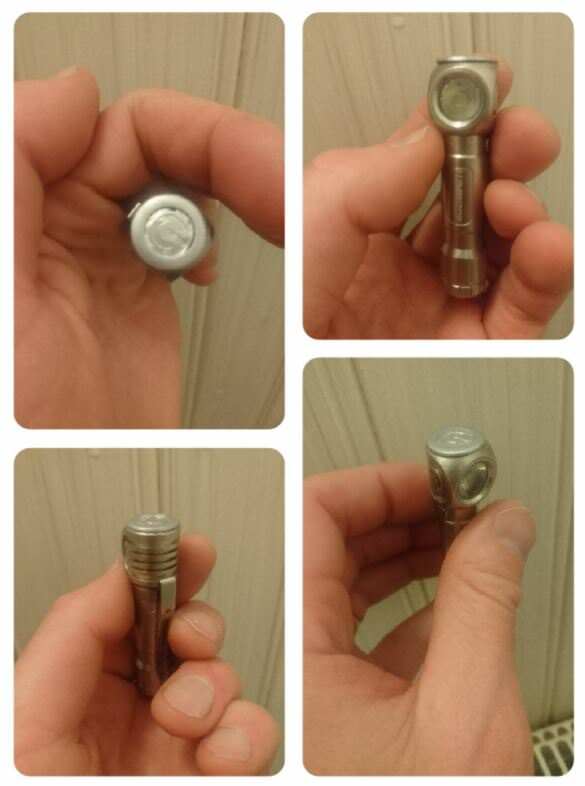 It is the shortest AAA light i have. 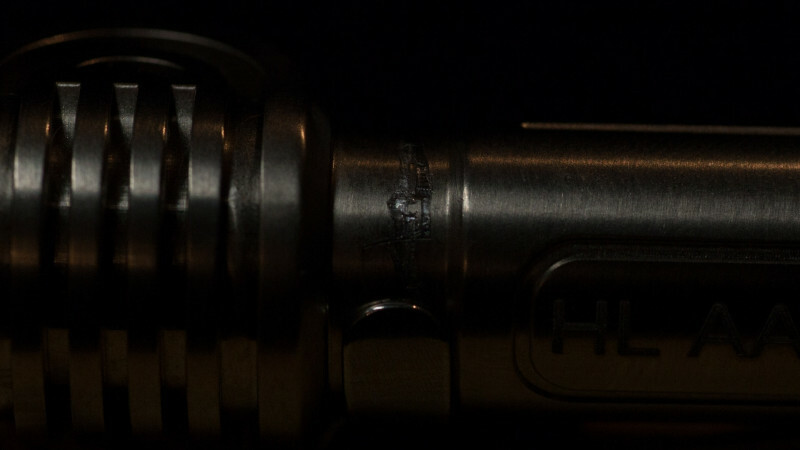 About 5mm shorter then Convoy Tiny Torch and Jetbeam Jet µ for instance. That's a Maratac TPF. Great little light. That’s a Maratac TPF. Great little light. 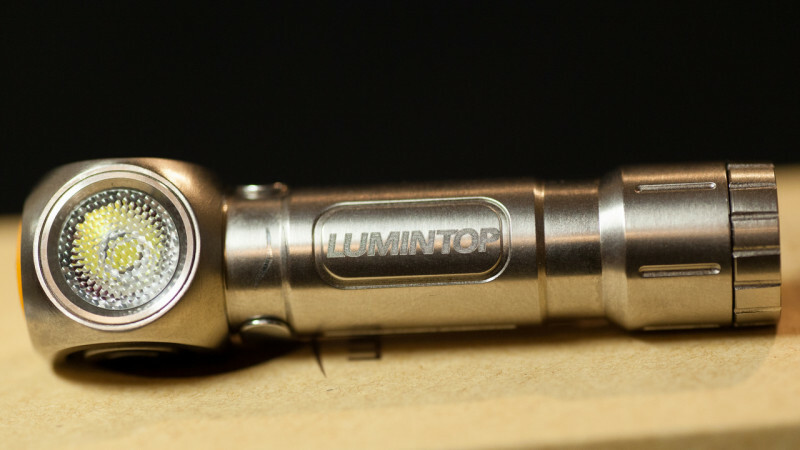 Thanks, 160 lumen! I like it! 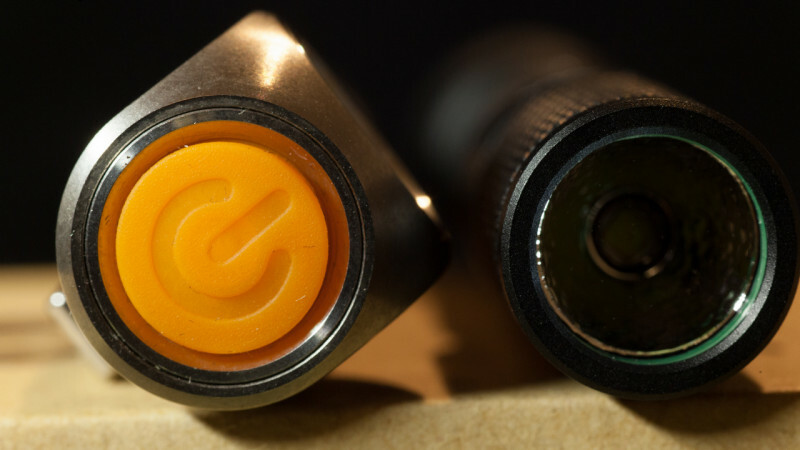 Too bad there’s no warm/neutral white option or nichia option. Yes that is unfortunate, thanks I forgot to look for that. 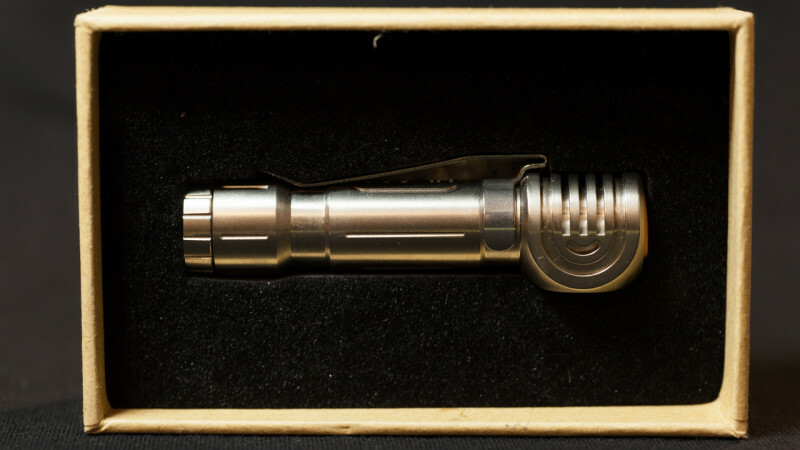 Maratac TPF: Great numbers for a small light. I especially like that there's no hotspot and still very bright. I just got mine in, sweet little hl. Has anyone tried a 10440 yet? I use a 10440 in the tool and no issues. Kinda afraid to try it in the HLAAA. 160 lumen! I like it! Has anyone tried a 10440 yet?. Cant translate this vid but it looks like he puts in a 10440 and it turns on as soon as he starts to put on the tailcap and then it looks like he cant turn it off. Can you please tell me where, at what minute mark?